CHICAGO, June 3, 2013 – The Loyola University Museum of Art (LUMA) presents two comprehensive exhibitions displaying the work of writer and artist Edward Gorey from February 15 to June 15, 2014. This combined exhibition will be the first major exhibition of Gorey’s work in his hometown of Chicago. Elegant Enigmas: the Art of Edward Gorey and G is for Gorey – C is for Chicago: The Collection of Thomas Michalak both provide an in-depth look at this artist whose work was known for cautionary tales, dry wit, and characters costumed in the Edwardian style. 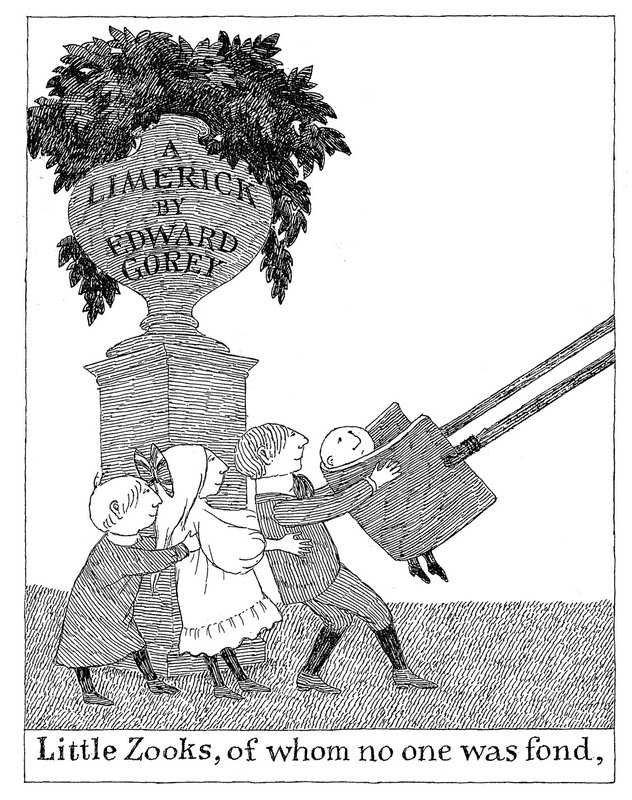 Gorey’s legacy is shown through the hundreds of original drawings, works, and illustrations, and ephemera of popular culture included in the two exhibitions. Gorey is well-known for the opening animated credits of the PBS television series Mystery! (now Masterpiece Mystery). His influence on other artists, illustrators, and sub-cultures is significant as well. Film director, producer, and artist Tim Burton, and writer Daniel Handler, most famously known as Lemony Snicket, have all been influenced by Gorey’s unique style and dark humor. Gorey (1925–2000) was born and spent his early years in Chicago attending Francis W. Parker School and, for a short time, the School of the Art Institute of Chicago. He came from an artistic background with his father as a Chicago newsman and writer and his maternal grandmother as a greeting card designer and illustrator. Elegant Enigmas was organized by the Brandywine Museum in Chadds Ford, Pennsylvania, with the cooperation of the Edward Gorey Charitable Trust, and has been traveling throughout the United States with great success. Previous cities include: Chadds Ford, Pennsylvania; San Antonio, Texas; Orlando, Florida; Boston, Massachusetts; Portland, Maine; and West Palm Beach, Florida. G is for Gorey is a companion exhibition from the Thomas Michalak Collection, which was recently given to Loyola University Chicago Libraries. Thomas Michalak (BS ’63), a retired Harvard librarian and member of the board of directors of the Edward Gorey House in Yarmouth Port, Massachusetts, has been collecting Gorey materials for over 35 years. The exhibitions are co-presented by Loyola University Chicago Libraries and LUMA with the cooperation of the Edward Gorey Charitable Trust. Companion programs of literature, theater, music, and other events will be announced fall 2013. A Gorey Birthday Ball to benefit Loyola University Chicago Libraries and LUMA will be held on February 22, 2014. For more information, visit LUC.edu/luma. 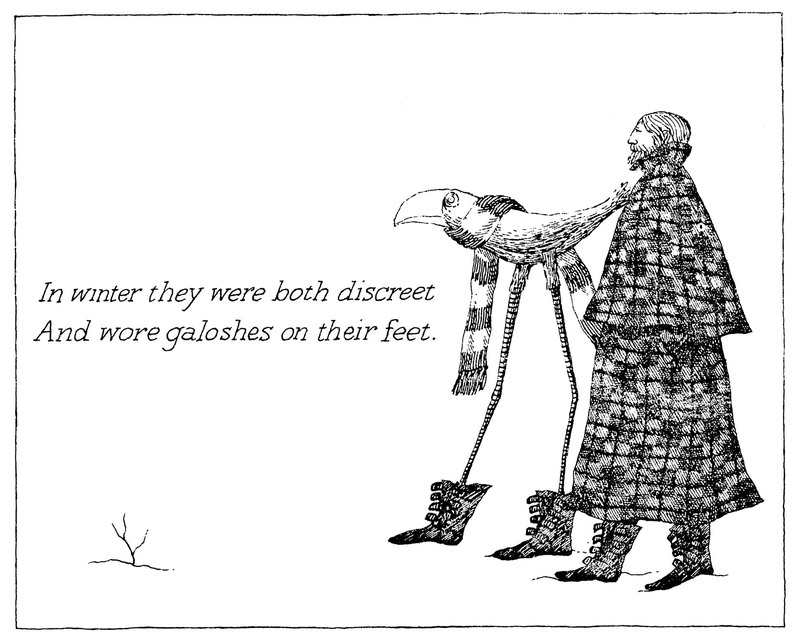 Illustration[s] © The Edward Gorey Charitable Trust. All rights reserved.